Last week, WDG’s senior Drupal developer, Grant, traveled down to Texas for DrupalCon Austin 2014. The barrage of parties aside, more than 3,300 Drupal developers, designers, and agencies were there attending various networking and educational sessions to learn more about new innovations in the Drupal community. Grant gave us the lowdown of some of his favorite keynotes and sessions during DrupalCon. Read on to learn more! 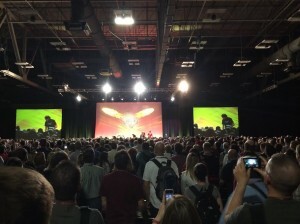 DrupalCon Austin 2014 has come and gone. It was a truly awesome experience; from the sessions, the people, and the after-parties, there wasn’t a dull moment when the Drupal community took over Austin for a week. There were over 3,000 attendees this year and for those of you who couldn’t go, I’ll give a quick rundown of my favorite moments. Dries Buytaert’s keynote was my favorite session of the week, by far. For the first part of his talk, I think he caught a couple people off-guard by giving an abstract perspective of where the web is heading, instead of mentioning Drupal. By addressing the future of the web, he brought light to the decisions made for Drupal 8 in order to keep up with those trends. Buytaert also spent his time describing how Drupal processes have improved, talking about everything from photography to e-commerce. His underlying message was that Drupal must continuously transform to stay ahead of the technological curve as a leading CMS. In terms of time and money spent, a complete overhaul of Drupal 8 is a pain in the a**. However, in the long-term, it will benefit theDrupalcommunity as a whole. Instead of patching problems that were commonplace in Drupal 7, the community has taken an approach to rebuild the system from the ground up. The second half of his keynote addressed the changes and improvements that are being made in Drupal 8. The two things I’m most excited about are the improved content authoring experience and the ability for Drupal to be a true RESTserver through the Web Services and Context Core Initiative (https://groups.drupal.org/wscci). The goal of the Drupal 8 WSSCI initiative is to make it as easy to output content in HTML as it would be JSON or XML, which will lead to more integrations with mobile and web services. This was a pretty cool session demonstrating the power of Views, which lets Drupal administrators control how lists of posts are presented. The speaker gave a live demonstration of how to combine 3 different views into one, without touching a single piece of code. While it was great seeing the versatility of Views, methods like this one can have performance issues. As a front-end developer, this session was especially interesting to me. Although the Drupal 8 release seems far off, it’s never too early to start preparing for what’s coming. The new theme layer brings a lot of changes that will be drastically different from PhpTemplate. That being said, I am particularly excited about the Debug mode in Twig. If you’re like me, you’ve probably spent most of your development career working at a consulting shop or agency. There have been many times—usually over a beer or two—where we come up with open source product ideas. This session addressed the product development lifecycle and a product’s viability as it relates to Drupal and the open source community. NPR is a huge organization. This session described how NPR used Drupal to serve content to over 150+ affiliate stations. This was an interesting talk for two reasons: 1) It gave proof to the scalability of Drupal, and 2) it was a reflection of the lessons learned from such a large-scale project. With free beer and food from 6:00pm to 9:30pm, how could you not have a good time? Bangers, a restaurant in Austin, had over 32 different beers on tap to choose from and there was live music provided by the Soul Supporters—voted the “Best Soul Band” of 2013 in Austin. The teams at Pantheon and New Relic really went all out for this one. 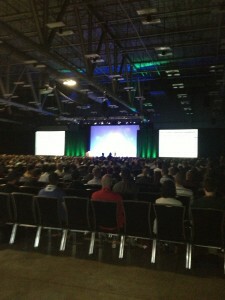 Conferences like DrupalCon constantly push the boundaries of innovation in the design industry. At WDG, our talented team of Drupal designers and developers build upon those innovations to create interactive and functional digital solutions for all of our clients’ needs. Our work with clients ranging from small non-profits to large global corporations has been noticed on local and national levels: in 2014, WDG was ranked one of the best Drupal Web Design companies by 10 Best Design. Interested in embarking on a Drupal project? You’re at the right company. Contact our team here!